Sunbonnet Sue and a friend finish the daily chores sweeping, baking, laundry, ironing, marketing, mending and singing in the church choir. Embroider these designs in full color and tint with fabric paint or embroider in Redwork! Iron-on transfers are good for two or more transfers each. When transfer is used up, it can still be used as a traceable design. Transfers are dark gray lines and work best on light colored fabrics. If you are using 100% cotton, transfers should wash out to faint lines or wash away completely. Designs are 6 1/2" tall. 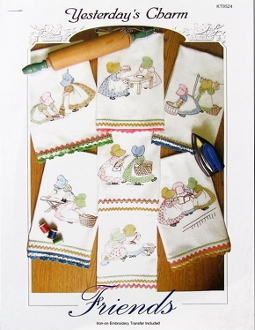 Includes: full-size iron-on embroidery transfers patterns, stitch illustrations, color chart.